New York City is simply magical during the Christmas season. Christmas on Wheels takes riders on a 2.5-hour guided tour of some of the most iconic holiday installations in Manhattan. This carefully crafted tour showcases the city in a totally unique way - get in the spirit of the season as you ride throughout the city - laughing all the way! See the city at its most magical on a Christmas tour by bike! With a seasoned New York City guide riding along, you’ll start in Central Park, where you’ll see the sites of some classic holiday movies. 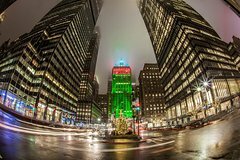 Other highlights include the famous Christmas tree at Rockefeller Center, window displays at Macy’s, and holiday fairs at Grand Central Terminal and Bryant Park Winter Village. Christmas on Wheels will be led by professionally trained guides and filled with historical anecdotes — of the festive variety — as riders arrive at each tour stop. Riders will be able to walk around and take photos at each stop and browse the holiday gifts at the fairs. Finish with a cup of hot chocolate, a perfect treat for a cool holiday ride. Don’t miss the chance to shift gears and awaken holiday cheers!